Germany’s Mona Barthel celebrates after winning the Paris WTA tennis tournament final match against Italy’s Sara Errani on February 3, 2013 in Paris. Barthel won 7-5, 7-6 (7/4). 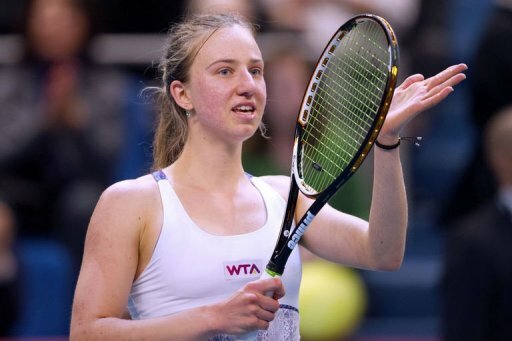 World number 45 Mona Barthel of Germany upset the odds to beat top seed Sara Errani of Italy 7-5, 7-6 (7/4) in the final of the Paris Open on Sunday. Barthel seemingly had the edge on several occasions in the French capital only for seventh-ranked Errani to reel her opponent back in before the German finally ended Errani’s dogged resistence after one hour and 56 minutes. The title was Barthel’s second on the WTA Tour — and her first at a Premier event — following her maiden triumph in Hobart a year ago. “I didn’t expect to win here, at a tournament with as many good players, it’s really great,” said Barthel. “It was nerve-wracking. It was my first big final so I was a bit nervous,” added the German. Bidding to follow in the footsteps of last year’s champion and compatriot Angelique Kerber, Barthel made the first breakthrough at 4-3 in the first set, punishing a weak second serve from Errani on break point, but the German spurned a chance to close it out in the following game as Errani broke back immediately. However, the 22-year-old earned a second chance at 6-5 as a fizzing backhand down the line brought up two set points with Barthel duly converting as Errani fired long. The pair then exchanged early service breaks in the second before Barthel clawed in front again at 4-2. A subsequent hold presented the German an opportunity to serve for the championship, but Errani once more refused to surrender and broke to get back on serve. With the world number seven then serving to extend the contest and force a tie-break at 5-6, Errani appeared doomed as Barthel carved out two match points only for the Italian to save the first with a swinging volley after a long rally before Barthel misfired with the return on the second. It proved merely a stay of execution for Errani, though, as Barthel clinched victory at the fourth time of asking with a thumping forehand winner in the tie-break.